Are you as confused about credit transfer as the rest of us? Most students who start college will switch schools before they earn their degree. And more than 50 million people over 25 who never finished college will need to transfer credits to do so. But the process of transferring credits can be frustrating, idiosyncratic, and incomprehensible. If you plan on transferring credits, this guide can help you cut through the confusion and end up with the degree you desire. What’s inside can help you get the credit you deserve at the school you want to attend! Brought to you by StraighterLine, a leader in providing self-paced, online college courses for transfer students and adult learners. 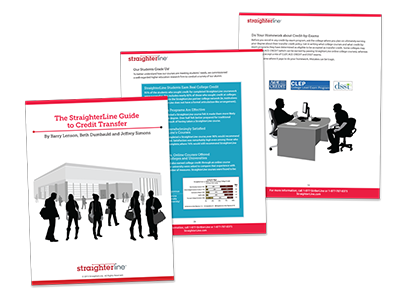 You can now download and enjoy The StraighterLine Guide to Credit Transfer.